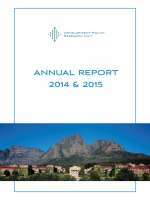 A limited number of printed copies of the DPRU’s past annual reports are also available on request from the Unit’s publications library (contact sarah.marriott@uct.ac.za for more information). The DPRU's achievements and the impact of our research work in 2014 and 2015 revolve around an attempt firstly to initiate a more active research agenda on Sub-Saharan Africa. In particular, we have attempted to shape a research agenda grounded in empirical labour economics, but applied to low income countries in Africa. This is virgin territory globally, and as a consequence has placed the Unit at the forefront of a unique and innovative global programme. 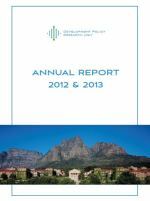 The DPRU continued its engagement with labour market issues during 2012 & 2013. The Unit's research into minimum wages was especially noteworthy, with a paper on minimum wages in the agricultural sector receiving significant public attention during the farmworker strikes during late 2012. The DPRU is also a partner in a new multi-year research programme, The Labour Market Intelligence Partnership, formally launched in September 2012, focusing on creating a credible labour market intelligence framework to ensure better information gathering, analysis and overall systems synergy. Reflecting on 2010 and 2011, three new developments within the DPRU best define why the unit is entering a particularly exciting phase of its history. Firstly, we are privileged to be part of the Africa Growth Initiative (AGI), based at the Brookings Institution. Secondly, the presence of the National Research Foundation Chair in Economic Growth, Poverty and Inequality has enabled the unit to attract and source a supply of freshly minted, young, UCT-trained economists. Thirdly, the DPRU’s research programme has been able to enter new terrain, principally through the availability of unique or new datasets, such as recipients of unemployment insurance, dispute resolution and even strikes. The DPRU can once again look back on 2009 as an immensely successful year on a number of fronts. Prominent amongst our achievements is for example, is an international, collaborative project focused on the impact of government’s mandated sectoral minimum wages on employment and poverty – and the extent to which these minima are enforced. The ability to combine hard data and econometric work into a project that examines the historical evolution of collectively bargained wages delivers key new information on the evolution of wages in South Africa – but will also prove to be an invaluable public good for future researchers wishing to work on historical wage developments in the economy. The DPRU’s research programme for 2008 was manifest in a significant leap in terms of expanding our knowledge and appreciation of South African labour market policy issues. Working papers and projects ranged from a detailed legal analysis of labour market regulation in SA to an econometric investigation of dispute resolution and bargaining councils in post-apartheid South Africa. The Unit’s continued programme management role in the Employment Promotion Programme has been instrumental in allowing the Unit access to some of the key policy debates and issues in South Africa. The DPRU can be proud of a successful, if packed, 2008 marked by our seventh national conference entitled The Regulatory Environment and its Impact on the Nature and Level of Economic Growth and Development in South Africa.